The sequel to Goosebumps is now available on Blu-ray, DVD and Digital. With their after school junk business, best friends Sonny and Sam hope to find treasure in other people’s trash. But when cleaning out the old Stine house, they open a locked book that frees a supernatural nightmare - Slappy! The book is Haunted Halloween and it's R.L. Stine’s unfinished novel. A story without an ending is particularly dangerous as you never know what can happen. Now, with the help of Sonny’s sister Sarah, they’re in a race against time to get the sinister dummy and all the creatures he’s brought to life back into the pages before he unleashes total pandemonium! Sonny (Jeremy Ray Taylor) and his Sam (Caleel Harris) are best friends. They are starting a junk hauling business, which leads them to an old house full of “treasures”. The house belonged to R.L. Stine and in it they find a locked book. As we learned in The Mummy and Goosebumps, reading a book can be dangerous. Opening this book allows Slappy, the evil ventriloquist dummy to appear. Slappy might be small but with him running around, everyone is in danger. At first, Slappy appears to be helping the boys but soon his true nature is evident. The boys are forced to recruit Sonny’s older sister Sarah (Madison Iseman) when they realize they have gotten in over their heads. Sarah is more concerned with a cheating boyfriend and college essays, but she has no choice but to help the kids battle this demented doll. They hope to keep the events off the radar of their working mom (Wendi McLendon-Covey) as they fight gummy bears and other creatures from the book. Goosebumps: Haunted Halloween feels very much like a direct-to-Blu-ray release, but a good one. The first half of the film had me thinking it was better than I expected. As it went on, it felt like a lot of the same thing. The dummy, the fights with gummy bears, it’s just like the first movie. Goosebumps had some crazy things happening, and it had a really good story beneath it. This is one the kids will like, and the parents won’t mind. The young actors are all very well cast. They don’t have terribly complex characters, but they inhabit them well. Ken Jeong plays a Halloween obsessed neighbor and Jack Black does have a cameo. Unlike the first movie, this one is not scary. Slappy is sillier and the whole film feels lighter. It’ll be a fun watch again next Halloween, but I don’t think my family will put this one into regular rotation. 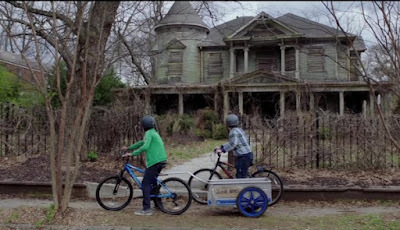 Goosebumps 2: Haunted Halloween's Blu-ray offers a clean, clear image. Colors are bright and bold and black levels consistent. Halloween offers rich purples and bright oranges. Skin tones are accurate. Depth and shadow present very well. Slappy’s wear is one of the fine details you’ll find easy to spot. Goosebumps 2: Haunted Halloween’s Blu-ray incudes a DTS-HD Master Audio track. Music, dialogue and sound effects are all well supported. Party music and a concert provide the crowded feel and sound appropriately different than the film’s score. Sonny’s school Tesla project provides bolts of energy with directionality. Overall, it’s an uncomplicated but well audio presentation. Deleted Scenes (2:19 total runtime): Tommy the Ice Skater, Mr. Chu's Porch, and Pumpkin Man. Gag Reel! (2:37): Laughs during shooting. Thrills & Chills - The Making of Goosebumps 2 (9:56): A featurette exploring the cast and story. Meet the Monsters (8:32): An in depth look at the monsters including design and construction. Science with Slappy (1080p): Five segments with Slappy and the cast experimenting or explaining Science. Includes: The Scientific Method & Gummy Bears (4:15), Light It Up with a Tesla Coil (1:36), Static Electricity Ghosts (1:37), What Gives Us Goosebumps (0:47), and Chemical Reactions & Slime (3:17). Slappy-Oke Sing Alongs: Slappy karaoke: Take Me Out of the Manuscript (1:37), Where Is Slappy? (1:30), and Holiday Slappy-Oke: Slappy Spells! (1:14). Junk Brothers - Call Now! (1:13): Sonny and Sam’s commercial for their junk removal business. Slappy's Audition (2:00): The dummy auditions for his part in the film. Goosebumps 2: Haunted Halloween isn’t going to knock your socks off. It doesn’t hold up as well as it’s predecessor and might actually be more fun when watched together. It’s a family friendly film, and one that a younger audience can handle. It was well cast and entertaining. The Blu-ray is technically sound with sufficient audio and video and a handful of fun extras.